Shuttles are subject to the Pike's Peak toll road hours of operation and road conditions. This route links together several trails in the Colorado Springs area to provide 7,120 feet of descending. This route is best serviced by shuttling up Pikes Peak to the Elk Park Trailhead. Otherwise, this becomes a MUCH longer ride. These trails are multi-use. Look out for others, including dirt bikes, horses, and hikers! Don't expect cell service after you drop into Elk Park until the top of Buckhorn. Pack to self support. The Lake Moraine Trail is isolated. Access for rescue is very difficult. If you plan to utilize the Barr Camp, familiarize yourself with their hours of operation and amenities here. Begin by dropping in on Elk Park from the Elk Park Trailhead. Navigate this technical trail and its abundant rocks until it intersects the Barr Trail. If open, the Barr Camp can provide a good rest area. Refreshment and bathrooms are available here as well as shelter from storms. Continue downhill past Barr Camp. Watch out for hikers! Barr Trail can have plenty of uphill traffic. Enjoy some high speed jumps until the right turn onto the Mountain View Trail presents itself. Travel roughly halfway down this trail until you see a turnoff onto the Lake Moraine Trail. Enjoy cruising down the first mile because afterwards, it's all uphill until you hit Jones Park #667. The next section, Jones Park #667 to Kineo Mountain Trail #667 to Upper Buckhorn #667, provides some fun switchbacks and high speed flow as you hoot and holler your way down. When you reach the top of Buckhorn, get ready for some fun exposed downhill as you blaze towards the classic Captain Jack's. 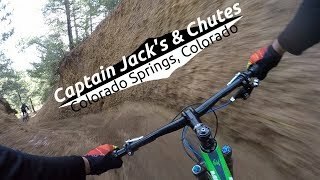 Jack's is a GREAT trail, although if it has been dry, the gravel can shake up even the expert rider. Riding shortly after a rain can make this section much more confidence-inspiring. After the final bumps, Jack's will send you on your way down Gold Camp Road. Fear not! This is not a long journey before the singletrack resumes down The Chutes. The Chutes is just plain fun! High berms and flow will rocket you out to the Ridgeway parking area. Just off the trailhead at the top of The Chutes. The start of a difficult way down.